I got into a short exchange with someone on a friend’s Facebook page who insisted that I sounded angry about the Umpqua campus shooting that killed 9 people. This guy didn’t think anyone should be talking about a solution to our latest national tragedy. If we wait to talk about these tragedies until a sufficient time has passed, we will never be able to talk about what is needed to stop the next one. 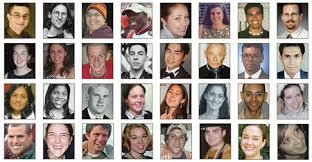 The rate and frequency of mass shootings is increasing and the every day shootings continue unabated. 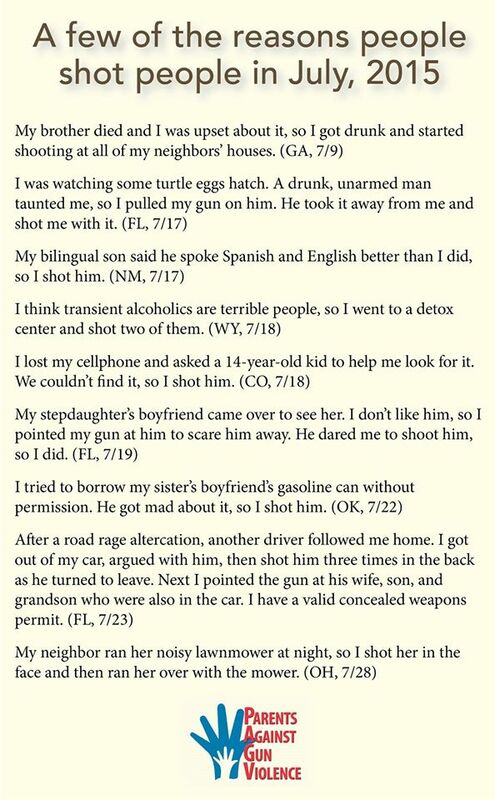 The corporate gun lobby would be very happy if we didn’t talk about the carnage. Because discussing the problem and the solutions keep the issue front and center and remind the public of the victims. But we will not be silent. People are angry right now. Just as we were angry after 9/11. And then we began the discussion about solutions immediately and continue it even until today. Why not talk about our American tragedy of gun violence right now? It’s past time to have the discussion and the actions we should have had and taken a long time ago. More than 10,000 Americans are killed every year by gun violence. By contrast, so few Americans have been killed by terrorist attacks since 9/11 that when you chart the two together, the terrorism death count approximates zero for every year except 2001. This comparison, if anything, understates the gap: Far more Americans die every year from (easily preventable) gun suicides than gun homicides. We’ve had enough of this. Collectively Americans have had enough. Our politicians are playing games with the lives of their constituents by not acting yesterday to do something about gun violence. A number of letter writers in today’s Star Tribune reflect what the majority of Americans believe about guns and gun violence. Common sense is alive and well but ignored by our elected leaders whose decisions not to deal with laws that could save lives are shameful and dangerous to our communities. 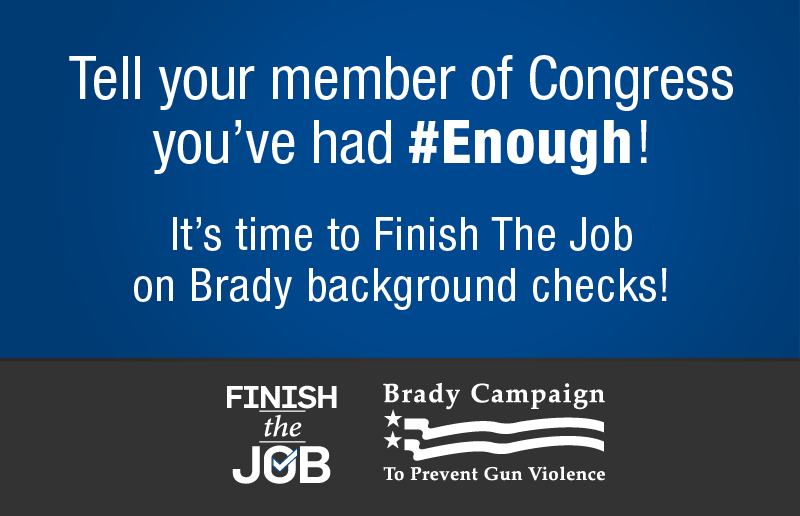 The Brady Campaign/Center to Prevent Gun Violence has a new #Enough! campaign. The intent is to put pressure on our elected leaders to reflect the desires of the majority to get something done to save lives. Watch their website and social media for more information to come. One of the most effective measures to keep guns out of the hands of people who could be dangerous to themselves or others is requiring Brady background checks on all gun sales. Congress could do this today if they had the courage and the will. Two bills are sitting on the desks of our Representatives. One is HR 3411 sponsored by Congresswoman Jackie Spears and the other is HR1217 sponsored by Congressmen Peter King and Mike Thompson. The bills are ready to go. So let’s push for them to be heard and voted on. Lives could be saved with the passage of either bill. Where is the leadership when it comes to saving lives? Meanwhile, while we are waiting for our leaders to choose to stand with victims and families, people are dying every day. We’ve had enough. The families have had enough. Communities have had enough. And the bodies are piling up. The Umpqua campus shooting has provided 9 more of them. 9 more families are grieving along with friends and the entire community. The ripple effect of gun violence goes wider and wider every day. Every community is affected at one time or another. And now Roseburg, Oregon is the current center of the public’s attention and sympathies.They are mourning now. Soon enough, they will have to move on and live around the hole left in their hearts and their families by the loss of a loved one. Reality will set in. We can hope that some of these families will join us in our efforts to prevent others from going through their loss and their pain.